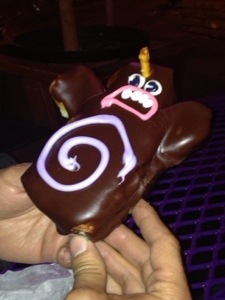 Today is brought to you by a donut from Voodoo Donuts. As artists, it’s not uncommon for us to get stuck in a rut in terms of the art and media we consume. I know writers who only read one genre or only fiction. I know musicians who only listen to one type of music. As pure consumers of art and media, this is fine. However, as producers of art and media, we need broaden our experiences. I frequently talk about building compost in our brains. This compost is made of the art, media and experiences, etc., we’ve consumed and have been exposed to. All this input gets sucked in by our brains and then… well… composted. Turned into mulch from which we create our own art. Yeah, our imaginations get in on the gig, but that compost is essential; our imaginations draw on this compost. As we begin the new year, I’d like to challenge all of you to consume art and media you’d not normally take a taste of. 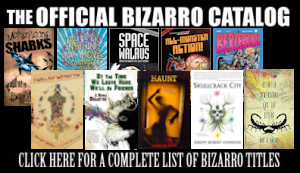 If you only read horror, try some alt lit. If you only read fantasy, try some crime. Actually, why not go all out and try some short stories and novels in a genre you don’t typically explore? While you’re at it, get some poetry and non-fiction into your compost, as well. Writers and filmmakers–check out movies and TV you’d not normally watch. Musicians–listen to music you’d typically never listen to. Artists–check out some art that’s that’s a 180 from where you usually play. Though it’s likely you’ll run into art and media that’s not you’re thing, you may find a new favorite. You may find inspiration for your own art and discover a new way to freshen your own playground. If nothing else, you’ll add to your compost; who knows where that might lead in the future. As for myself, I’m going to check out a bunch of westerns–novels, short stories, poetry, non-fiction, films and TV shows. What are you going to check out? What are your favorite ways to mix up your compost? Spike Marlowe has held a number of odd jobs, including working in a wild west show, as a detective, as a Bigfoot researcher, as a writer for an Internet content farm and as a busker. 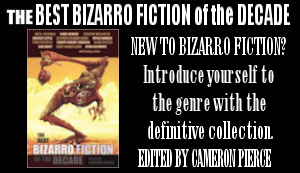 These days she’s a writer, blogger and bizarro editor for Eraserhead Press, with a focus on the New Bizarro Author Series. Her first book, Placenta of Love, is now available at all the usual locations. You can stalk her online at her website, Facebook or on Twitter at @spikemarlowe. This entry was posted on January 27, 2014 by spikemarlowe. 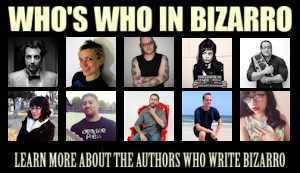 It was filed under Authors, BizarroAuthor, Writing Advice and was tagged with spike marlowe, The Tea House. Very true, I like to watch high art stuff but also complete trash, I think it’s good for you.